A little sweet, a little salty, and a lot of chocolate. Welcome to my newest no bake chocolate slice. 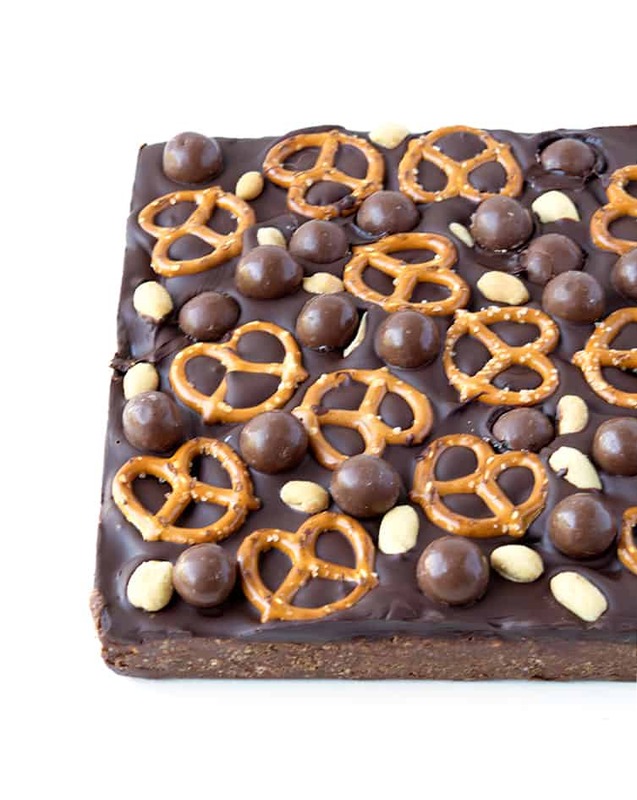 This chocolate treat is packed with all the good things in life. 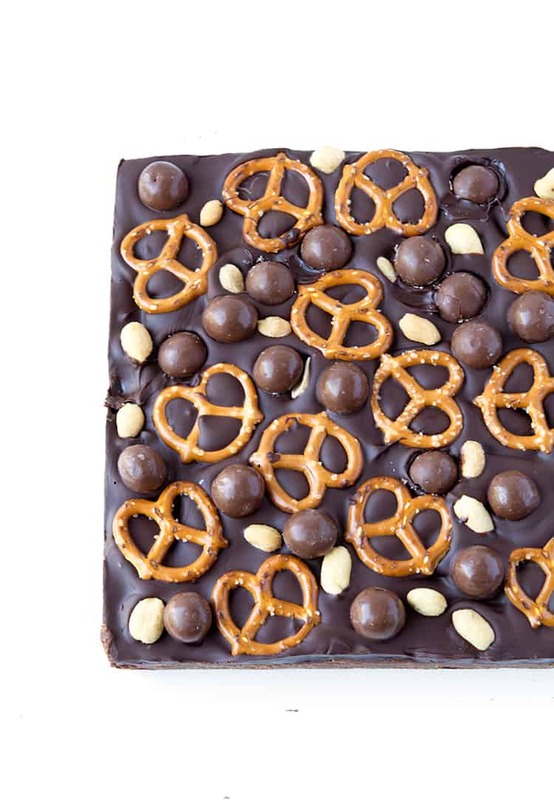 It all starts with a sweet chocolate mixture that combines crushed pretzels. sweet cookie crumbs, crispy rice cereal and salty peanuts. 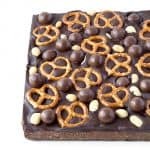 Then we take this Sweet and Salty Chocolate Slice to the new level, with a thick layer of gooey dark chocolate and more salted pretzels, roasted peanuts and chunky chocolate malt balls. I love slices and bars. I think along with cakes and cookies, they’re one my favourite things to make. Recently I’ve really been getting into baked slices like my Hazelnut Chocolate Slice and my Funfetti White Chocolate Brownies. But no bake treats will always have a special place in my heart. Sometimes I just don’t want to have to turn my oven on for whatever reason. And that’s when no bake slices are just perfect. 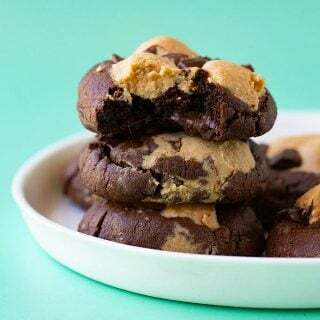 They’re super fun and easy to make and they can absolutely satisfy those sweet cravings. 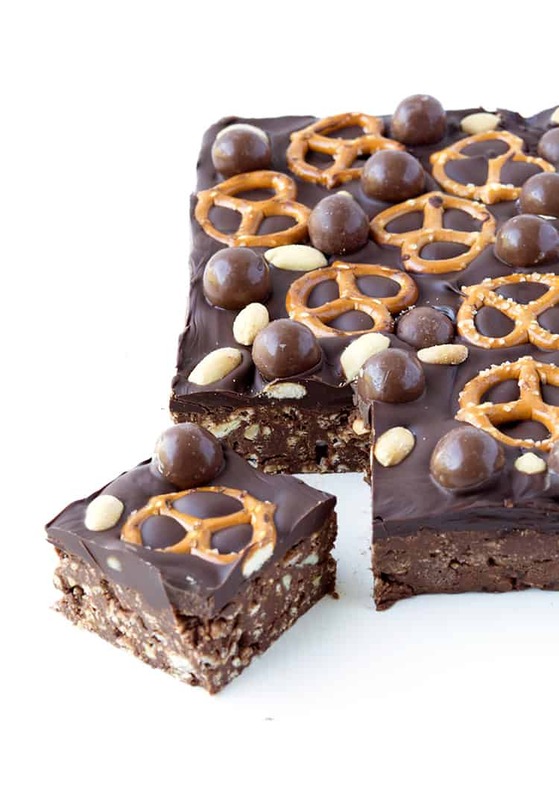 I would know, I’m eating a slice of this Sweet and Salty Chocolate Slice right now! With a chewy, sticky base of chocolate and sweetened condensed milk, this slice is then filled with all kinds of things. Some sweet, some salty, but ALL of them are delicious. All you have to do is mix it all together, throw it in a pan and then wait – the hardest part of course. What you end up with is a chocolate slice that’s a little crispy and crunchy with a soft chocolate flavour. 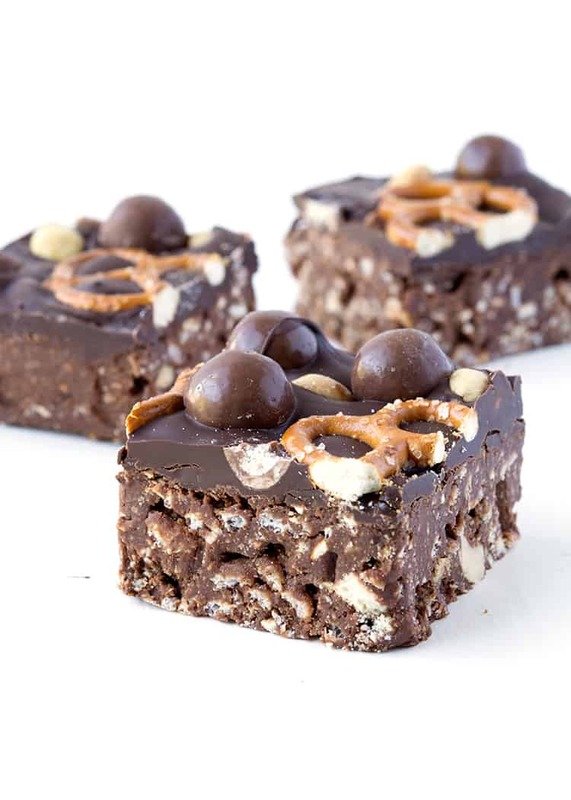 Theres crunch from the roasted peanuts and salty pretzels, and smoothness with the extra fudgy chocolate topping. Sticky, sweet and a little salty, this chocolate slice is, by far, my new favourite. It’s perfect for a party because you can slice up bite-sized pieces and serve it on a cute platter. Guests will love reaching for just one more piece. 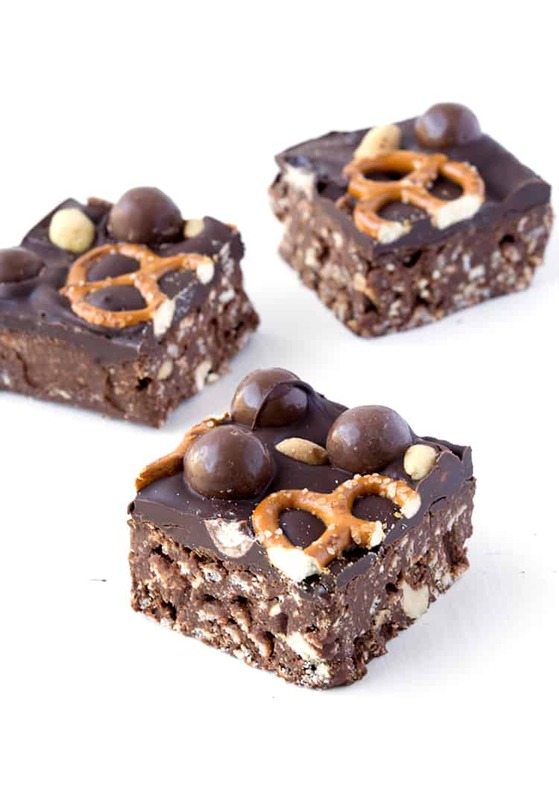 An easy no bake Sweet and Salty Chocolate Slice loaded with pretzels. cookies, rice cereal and peanuts and topped with dark chocolate and chocolate malt balls. Add your chocolate to your condensed milk, along with the crushed biscuits or cookies, rice cereal, pretzels, peanuts and salt. Stir until completely covered and then pour the mixture into your prepared pan. Smooth over the top. Pop in the fridge for at least 30 minutes. In a large heatproof bowl, melt the chocolate in the microwave for the topping. Stir often until just melted, add oil and stir until smooth. Pour chocolate over the top of your slice. Add peanuts, pretzels and malt balls. Refrigerate for 2 hours or until set. Then cut into squares to serve. Hi Lorraine! Aw I’m so glad you enjoyed it! Thanks for your lovely review, I can’t wait to see your photo! Hi Doriz, unfortunately I don’t know if you can replace the sweetened condensed milk in this recipe as I haven’t tried it with anything else. I’m not sure cream would be thick enough or set like condensed milk does. Sorry I couldn’t be of more help. Oh how I miss maltesers! This sounds absolutely HEAVENLY! 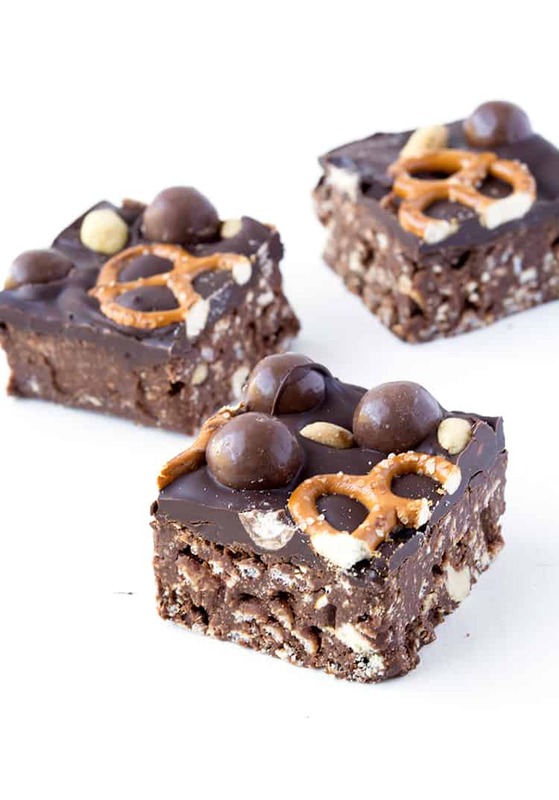 I think I’ll have to try this minus the maltesers and with gluten free cereal and pretzels! 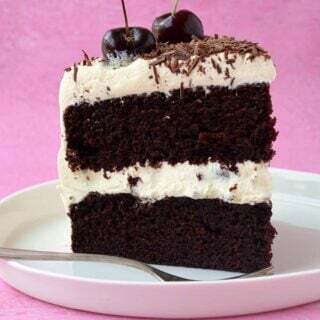 I love chocolate slice recipes and this one looks great. 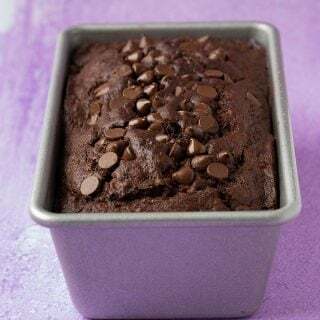 One quick question – for the topping, should you add the vegetable oil before or after melting the chocolate? I don’t see it in the instructions and not sure if you should melt them together (my assumption) or add the oil after you’ve melted the chocolate. Thanks for the confirmation on the oil. Alas, I cannot seem to find malt balls here (currently living in Geneva), but I’ve tagged the recipe for when I return to the US in a few weeks.